Insurance eligibility and the Risk Free Guarantee. How do I get a patient to green? Is my patient Risk Free? Why is my patient At Risk? This is part 2 of our Scheduler series. For help checking patients into the Scheduler, see Scheduler Part 1: Patient Check In. Alright, so we've checked all of today's patients into the Scheduler, and our Scheduler currently shows two categories: Action Required (red eligibility icons) and Scheduling Complete (green eligibility icons). Now we just need to get all of our patients to green, as indicated by a green eligibility icon! 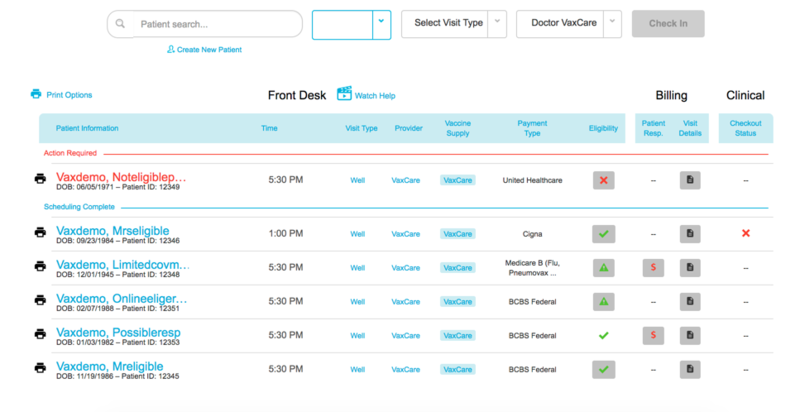 Just like the fictional schedule above, 80-90% of your patients will have a green icon, will move to the Scheduling Complete section automatically, and will require no further action. For example, both Mr. and Mrs. Eligible returned a green checkmark. If you click on their Eligibility Icon, the system shows they are Risk Free, meaning they are ready to be vaccinated! A green yield sign generally means that the patient is Eligible, but they have limited vaccine coverage, like a Medicare B patient only being eligible for flu, Pneumovax, and Prevnar. That’s why it’s always important to click on and read each Eligibility response until you are familiar with the responses the system is giving you. 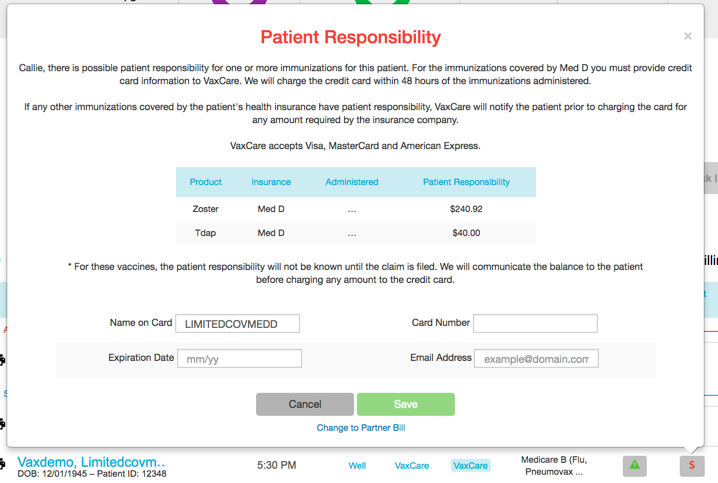 If any patient in the Scheduling Complete section shows a red dollar sign, this means you can vaccinate the patient, but in order for the vaccines to be financially Risk Free for your practice, you must collect the information requested. For non-Medicare patients, the red dollar sign is an indication that your patient has a high deductible plan and vaccine coverage that cannot be verified, so the pop-up will prompt you to enter a method of payment in case the patient has some financial responsibility. For Medicare D patients, the red dollar sign indicates that the patient has additional vaccines available to the patient through their Part D coverage and will show you the copays associated with those vaccines. Cash cannot be accepted for Medicare copays, so please follow the prompts in the pop-up. For patients in the action required section, where the icons are RED, simply click on the Eligibility Icon and follow the prompts provided in order to get the patient to green. Remember that our Risk Free Guarantee is here to help you, and a Not Eligible response just means that something is wrong with the information provided. In this case, our patient’s member ID is expired. We’ll simply update the patient’s insurance information when they arrive, select save, and then the eligibility icon will turn from a red X to a green check. Our patient will move to the Scheduling Complete section, and they’ll be ready to go! The takeaway: Always click on the Eligibility icon if you are unsure what a response means or how you can correct the issue the system has identified. Remember, the Eligibility responses are there to help you, so always follow the prompts the system is giving you. For more information, see: My Patient is Not Eligible. Need to change a patient's demographic information or method of payment? Check out Scheduler Part 3.